“A silhouette of the past....built in the present.” So states the brochure of boat builder Montreal Classic Boatworks in describing its almost exact modern recreation in fibreglass of a renowned Canadian designed and built wooden-era classic, the 1945 Myles Jeffrey 22-foot open utility runabout. Painstaking efforts have been made by the builder to retain the sensual impact of the original “woodie,” from its shape, to its layout, to its “look,” to its sound, and even to its seating position, while creating a thoroughly modern fibreglass runabout. The only wood (mostly imported from Italy) in the Bruce 22 is cosmetic – in the deck inlay, the seat and dash bases, and the inner hull and floor coverings. And these natural elements are all epoxy sealed and treated with a UV-inhibiting urethane. The basic construction including the hull, deck, transom, and stringer system is all the most modern technology hand-laid and vacuum-bagged fibreglass. Period looking but modern Stewart-Warner gauges provide the instrumentation. An authentic looking GM-authorized classic Chevrolet “Butterfly” steering wheel with chrome horn ring precisely controls the modern Teleflex non-power cable-to-rudder steering. A chromed lever on each side of the steering post handles the throttle and gear selection as in the original. Seating is classic-style marine vinyl over foam cushions on a front split-bench seat, plus a bench seat with filler jump seat forward of the central motor box and a full-width rear bench. Ample power is supplied by a choice of MerCruiser 180 or 220 HP inboard engines with a Velvet 1:1 ratio, straight-drive transmission. The burbling exhaust note at idle and while accelerating is absolute music to an aficionado’s ear. The ride is level and smooth with excellent handling characteristics yet drier and seemingly more comfortable than its “woodie” heritage due to modern design tweaks to its hull. The Bruce 22 is a head-turning classic design impeccably executed in even the smallest of detail. 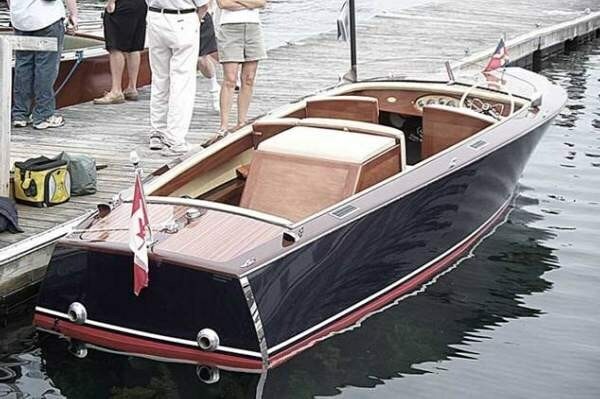 If you are after the look, the feel, the sound, and the attention a classic runabout offers but without the constant upkeep of an “original,” then the Bruce 22 deserves a close look.